Come & Play Some Games ! 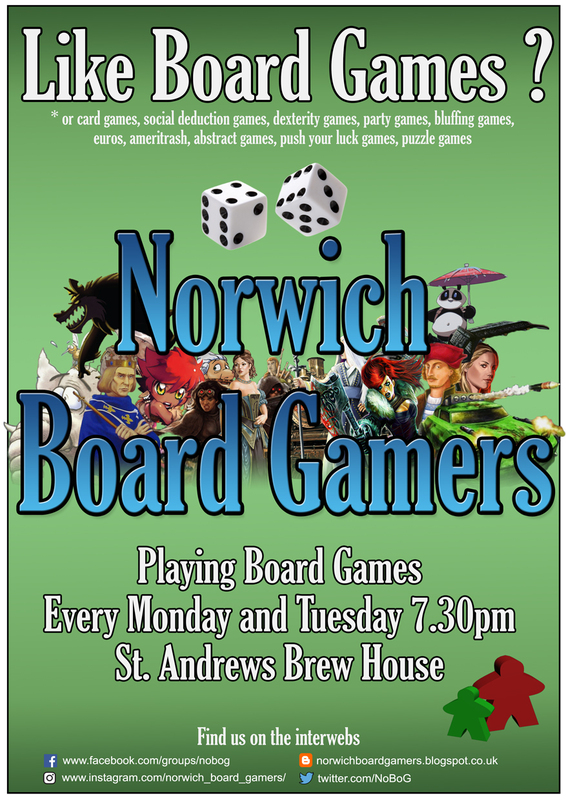 If you'd like to play some board games on a Monday or Tuesday evening, then why not head down to St. Andrews Brew House and join in. 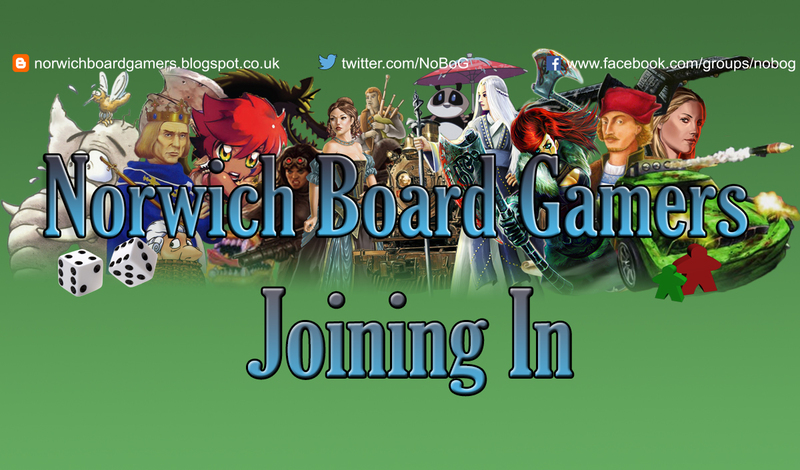 There are no fees, memberships or requirements about having games, being experienced or otherwise, so you can turn up, have a go and be welcomed by the friendly bunch of people that make up the NoBoG irregulars. It should go without saying that as we game in a pub, pub etiquette IS expected ( ie don't bring your own drinks ). St. Andrews Brew House has a lovely range of craft beer on offer as well as a great range of food and lots of other awesome things besides ( such as vegan and meaty sausage rolls ! ). We'd ask that if you enjoy gaming in a pub, please support them by buying a drink or three. Games start at 7.30pm, so try to be there a little before so we can assess numbers and see which games are suitable. People start turning up as early as 6.30pm for a chat or even a cheeky pre start filler game. We meet every Tuesday, but there is the occasional clash with other events or holidays, which means we can’t meet. Cancelled sessions will be announced on this blog or our Twitter feed or our Facebook group. Pub closes at midnight-ish , game play is typically a couple of hours ( but may be as short as 10 minutes and as long as 4 hours ) and some may like to play more than one game during the evening. Currently we get anything from 30 to 50 people on a Tuesday evening, so there is plenty on offer. We also have a Monday evening gaming session. Same place, same time, just a different day. So if you can't make Tuesdays, or want to game on both Monday and Tuesday, this is the day for you. Mondays are much quieter and skip much of the hubbub of game organisation and call out - typically we are getting around 10 - 20 people show up for gaming. Games are played upstairs where everyone will gather for the pre game shout out. We play all kinds of boardgames: strategy games, card games, miniatures games, war games, cooperative and even dexterity games. If you haven’t heard of any of these games or haven't played many games before - don't worry! The rules for a game are explained at the start and even the longest serving members are regularly learning new games. Everyone is welcome to bring along games they would like to play or think others may enjoy, but don't worry if you can't as there is always a good selection of games to choose from. After some friendly pre-game chatter, people shout out what games they have brought along and are willing to play, so we know what's available. If you have no games that's absolutely fine - keep your ears open for anything that sounds interesting, and then ask to play ! Most games are organised at the start of the evening post shout out. Sometimes games will be arranged in advance or pre shout out, but mostly the games are chosen on the night and players sit at the games they fancy playing. Don't worry about finding a game you like - we take care that everyone has a game to play, particularly newcomers, no one is left out, and we frequently sort people out individually if they are having trouble finding something or have no idea what to pick. Once a game has finished the table may start another game or players are free to break up and join other games that may be starting. Often the second games will be shorter to fit into time constraints, or to play larger more social games. We don’t (usually) play mainstream family games such as Monopoly, Cluedo or Trivial Pursuit. Nor do we play Scrabble, Bridge, Chess or Go, as they tend to have their own dedicated clubs - the same goes for Warhammer or Magic: The Gathering, though there may be some overlap. We take a certain pride and care in being friendly to newcomers and being considerate of social anxiety issues, we don't bite, so if you think you'd enjoy some good natured gaming, then please do come along. From time to time we get asked about young people joining in with the games we play, and the short answer to this is that for those under 16 you probably wont be able to attend. 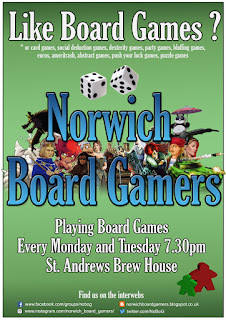 Whilst Norwich Board Gamers have no restrictions on the age of player, it should be noted that as we play in pubs of an evening, site licensing terms are in force which will often restrict those under 16 from attending, or imposing a watershed time on their attendance. This can vary from pub to pub depending where we are playing but in general anyone under the age of 18 must have an adult accompany them, and those under 16 will often have to leave the premises by 8/9pm. Given an evening start of 7.30pm for our gaming evenings, this makes NoBoG impractical at best or impossible at worst for those under 16. Ad-hoc parking is available around St. Andrews Brew House, parking restrictions are in places dropped after 6.30pm for single yellow lines, but there are also a number of car parks available situated close to the venue. Here is a helpful PDF map of the parking available. Closest car parks are St Andrews Multi Storey car park ( closest and best ) and the smaller, tighter St Giles Multi Storey carp park. £2.20 for the evening after 6.30pm. The Forum car park has a flat rate after 4.30pm. St. Andrews Brew House is located fairly centrally and is within easy walking distance of the main bus hubs available in Castle Meadow. If a bus goes to Norwich then chances are it stops at Castle Meadow, a mere 5 minute walk from St. Andrews Brew House. There are dedicated cycle parking facilities dotted around, here is a useful map of all the cycle racks and lockers. Norwich is served by its rather swanky Victorian era mainline station. A 10 minute walk from the station will get you to St. Andrews Brew House. However depending on your route the last trains from Norwich can leave relatively early - before 11pm. Check your rail timetable for details. Norwich has it's very own airport - the Norwich International Airport. Arrival here for some gaming is feasible, if impractical for a regular commuting type basis ( unless you are a fabulously wealthy and pampered jet setting type ). Taxi/bus/chauffeured limousine required after flight!